I am working on a series of Moving Pattern Videos that become time-based abstract paintings in pixels of light. The “Video Paintings” make formal references to abstract painting in that there are no recognizable objects in the forms. There is fluidity and a semblance to the cell/particle. The cell form is taken to be the movement of an individual among the masses or the masses in general. Soft amorphous forms full of color are in constant flux. The elements are similar and there is unity, but they also morph and flow. 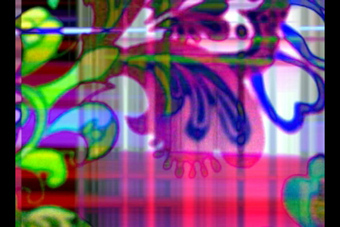 In other “Video Paintings” the pattern is used as a cohesive form, unifying the design. The patterns are derived from two sources. One is, found material from thrift store clothing with cell like patterns. The fabric is video captured while in rhythmic motion. Static cloth comes to life through movement. This transforms the seemingly ordinary cloth into compelling footage that is then altered again via software programs. The footage is edited, sound is added and synchronized to the movement of the shapes through the use of software. The second source of patterns are the seamless patterns generated in programs and then printed on a large scale. The camera sweeps across the print capturing the color and form of the patterns. The camera emulates the motion of dance, the flow of water, life as motion. Then the footage is manipulated and layered further. The video is finally edited and sound that is suited for each piece is generated and corresponding speeds are adjusted.